For serving: whole cooked chickpea beans, olive oil, lemon juice, parsley leaves coarsely chopped. 1. Cook the chickpea in a large amount of cold water. Add the onion and four cloves of garlic and bring to a boil. 2. Add the parsley, the coriander and the cumin. Cover the pot and continue cooking on a low fire until the beans and completely soft. During the cooking add boiling water if needed. Sieve the liquid and take out the herbs. Keep a bit of the liquid. Set aside some beans to add when serving. Grind the rest of the beans in a food-processor. 3. Gradually add the tahina until you have a uniform paste. Add some of the liquid you set aside so that the paste has the texture you like. 4. Add two chopped cloves of garlic and lemon juice. Add salt and mix well. 5. 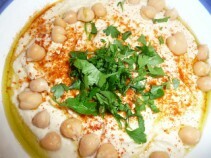 In order to serve on a plate, apply the hummus paste on the plate and add whole beans on top. Pour some olive oil and lemon juice and sprinkle with chopped parsley. 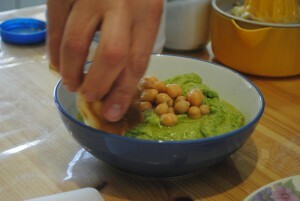 Green hummus - made with parsley and cilantro - delicious new variation to the hummus you know! Enjoy your home made amazing hummus!